Once you have a proper “minimalist program” in place, you’ll want to be certain you have the right nutrition lined up in order to support your training. Even though minimalist training does not require hours at the gym each week, it will still be stressing your body and increase your demand for both calories and nutrients. It’s important that in this over-load of information we receive daily that you do not try and complicate the nutrition process. We live in a society today where there is so much nutrition information that we are inundated with concepts and unfortunately much of the information out there is done with ulterior motives in mind. What you eat does have a very powerful influence on your overall health state so it’s not something to take lightly. There are certain nutrients you need to be consuming each day to avoid being at risk for deficiencies that can cause bigger, major problems to occur. The simpler you keep things the better…if you are going to stick to a healthy eating program for life, it must be something you can readily maintain for the long haul. Forget about the quick fixes or hundreds of diet books you’ve studied that promised some fast unrealistic way to drop 10 pounds and look great. Don’t get stuck in information over-load and stay paralyzed…it only prevents you from taking action and when it comes to nutrition and exercise in the end the only thing that really matters is “taking action”. You need to be focusing on basic sound nutritional concepts that have existed since the beginning of time when there was not the level of disease we see today. When you go back to basics and eat in a minimalist manner, you’ll find that your body just does what it should on its own. Only when you try and superimpose strict crash diets or other unnatural protocols that your body tends to fight back, and resist. By returning to basics the basics of well-rounded nutrition, you can quickly see how to eat not only for superior performance but for superior health as well. No matter what food choices you make, even healthy ones, if you simply eat too much food, you will increase your body weight. Only if that increase occurs because of an increase in lean muscle mass, if you are gaining muscle tissue and not body fat can it be considered a good thing. Most people find when they follow the minimalist exercise program that’s the results they achieve. However, if you are not training properly or simply eating too much food beyond what you expend each day then you are going to be gaining fat. (The body can only build so much muscle per day and this is important to remember). No matter what you’ve been told or what you presently choose to believe, the truth is, your body weight will be determined for the most part by energy in vs energy out, in other words, your calorie intake and expenditure are going to be what determines which direction your scale weight goes. Equally important to understand is that what you are really looking for is fat loss, not just reducing the scale number. True weight loss and health success are all about staying the course so keeping nutrition simple really is the key to the whole process. There are certain guidelines you need to be following that will keep things simple so you can experience long-term results. 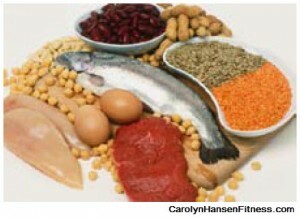 For example, one guideline is to make sure you get enough protein with each meal and snack you consume. Lean protein is what helps you preserver your lean muscle mass and keeps your metabolic rate healthy and strong. It also helps you to recover. Eating enough protein is just one of the guidelines I outline in my “Minimalist Nutrition Program” the second part of my “Minimalist Exercise and Nutrition Program” where I coach you on how to maximize both the efficiency and the effectiveness of what you are doing in both the gym and the kitchen.